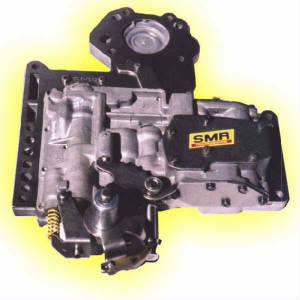 EVERY SMR TRANSMISSION IS HAND ASSEMBLED INDIVIDUALLY AND BLUEPRINTED ASSURING THAT EVERY SPECIFICATION AND DETAIL IS STRICTLY ADHERED TO. All frictions are new high temperature performance lined clutch plates. Precisely selected to provide the ultimate in shift quality, cooling and load capacity for the specific application. Special blends of Kevlar, resins and high energy fibers are selected. Extra plates are utilized to increase load capacity in high torque and overdrive applications. New U.S.A. made steels and surfaced pressure plates utilizing the appropriate surface texture required for optimum fluid retention and clutch performance. Varying thicknesses of clutch steels, selective snap rings, fiber washers and bearings are utilized to obtain precision tolerances to achieve optimum performance and durability. All bands used in shifting applications or transbrake functions are new severe duty high temperature or Kevlar lined. Severe duty sprag elements, sprag races and bolt-in overrunning clutchs are installed in specific applications. Ultra Sprag units are available for extreme horsepower applications. All of these components are resurfaced, rebuilt, modified or replaced with superior aftermarket components to provide the ultimate lubrication, performance and reliability. 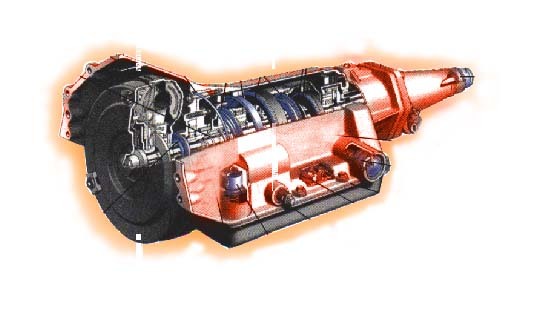 The latest advancements are incorporated into each transmission upon construction. Each valvebody is resurfaced, carefully inspected, bores are honed and spool valves are polished or replaced then modified to provide the ultimate shift control, converter fill, cooling and lubrication for the application. Each valvebody is final pressurized and tested to assure optimum performance. SPECIAL GEAR RATIOS, GEAR MATERIALS, BILLET, LIGHTWEIGHT AND ALUMINUM COMPONENTS AND ROLLERIZATION ARE AVAILABLE AT ADDITIONAL COST. CHECK OUR MEGA TORQ COMPONENT SECTION TO VIEW SOME OF THE EXTREME DUTY PARTS AVAILABLE FOR MOST 727 TRANSMISSION MODELS. THESE MODEL CLASSIFICATIONS REPRESENT THE DESIGN CATEGORY ONLY - EACH UNIT WILL BE DESIGNED TO SUIT THE NEEDS OF YOUR SPECIFIC APPLICATION.